Actually, both spellings are accepted depending on who you ask. We'll let you decide which you would like to use. Range: The entire range of the Lake Erie Watersnake exists on the U.S. and Canadian islands in the Western Basin of Lake Erie. With that being said, they are an endemic species to the islands, meaning that they can be found nowhere else! Coloration: The differences in coloration between watersnakes residing along the shoreline of the Western Lake Erie islands and those that are commonly observed within the nearby mainland marshes were first described by herpetologists Roger Conant and William Clay in the late 1930's. The classically described Lake Erie Watersnake is solid grey and patternless on its dorsal (back) side, with a cream colored vent (belly) also lacking any pattern. However, since island snake populations are not completely isolated from the mainland, the color pattern of LEWS is more accurately described as being reduced from that of the Northern Watersnake (Nerodia sipedon sipedon) which has pronounced patterning. In fact, populations of LEWS have an extraordinary amount of variation in the amount of patterning, making their identification based on color pattern alone very difficult. Coloration of LEWS are currently described by researchers as being either Banded, Unbanded or Intermediate. Reproduction: Lake Erie watersnakes mate from late May through early June. During this time snakes can frequently be found in large “mating balls” which typically consist of one female and several males. After a summer of eating every goby in sight the females give live birth in late August/early September to around 30 pencil sized young. Diet: Historically the LEWS diet consisted of roughly half amphibians and half native fish like madtom, stonecat, logperch, spottail shiners, etc. However, over time their diet has changed drastically. During the 1990’s the invasive round goby (Neogobius melanostomus) established itself in the great lakes and extirpated many of the native fish that LEWS used to eat. Today, over 90% of the LEWS diet consists of round goby with the remainder being made up of mudpuppies and what native fish remain at the bottom of Lake Erie. ​Conservation: Lake Erie Watersnakes were listed as federally threatened and state endangered under the Endangered Species Act in August of 1999. Steep population declines in this species were attributed to human persecution and habitat loss. In fact, this system has one of the most well recorded instances of purposeful human decimation of any snake species. A recovery plan was created in 2003 to describe goals to measure conservation successes within the species, which included habitat protection and management, population persistence, and a reduction in human-induced mortality. In 2011, the goals laid out in the Lake Erie Watersnake Recovery Plan were met, and this species was the 23rd species to ever be removed from the Federal List of Threatened and Endangered Species! Although the Lake Erie Watersnake is only listed as state threatened now, we continue to do long-term population monitoring and research, and extensive educational outreach to ensure that this species is conserved as a part of the Lake Erie island ecosystem. NONE of the snakes found on the Lake Erie Islands are venomous. Timber rattlesnakes used to be found on some of the islands but have not been found since the 1960's. Although people often claim that LEWS are cottonmouths/water moccasins these venomous snakes seldom venture any further north than the Ohio River. The photo, on the right, below shows the entire range map of all subspecies of the cottonmouth (Agkistrodon piscivorus). Notice that they are nowhere near Ohio! 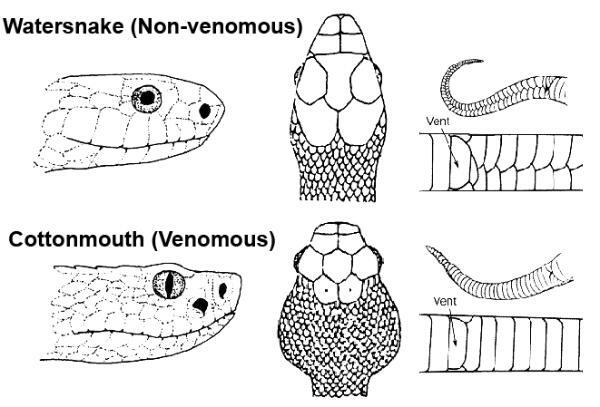 The photo, on the left, below shows the differences between venomous and non-venomous snake heads. Non-venomous snakes like LEWS have rounded pupils and lack the heat sensing pits of their venomous counterparts. Venomous snakes have vertical pupils and their heads are much broader than non-venomous species.